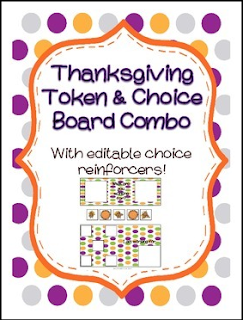 This token & choice board is designed to be used with students as an academic or behavior reinforcer. They are perfect to use with students with autism or other needs, discrete trial training, or behavior intervention plans. Included in this packet is 1 Thanksgiving themed token and choice board that are engaging to the student and small enough to be mobile. Instructions for assembly (with pictures) and guidelines for using with students are included which make this an easy to use resource in any classroom.